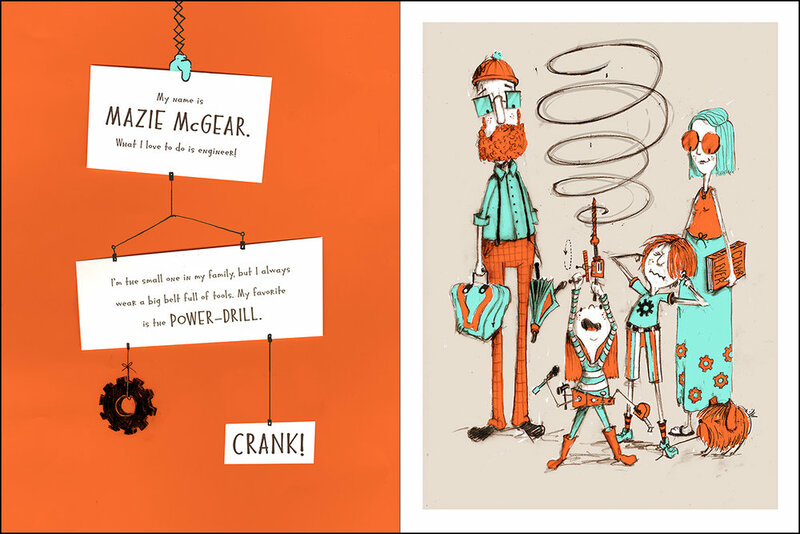 Mazie's Amazing Machines / by Sheryl Haft / published by Nancy Paulsen Books / Currently on the drawing board is the wonderful Sheryl Haft's "Mazie McGear" and her quirky mechanical adventures. The Eye That Never Sleeps / by Marissa Moss / published by Abrams Books for Young Readeers / I’m super excited to share the illustrated cover of The Eye That Never Sleeps by the wonderful Marissa Moss. (Published by Abrams Books for Young Readers) It’s my first delve into nonfiction and I’m completely hooked. I love me some research. The book is due out November 6th, 2018. I'll be periodically posting art from the book on my instagram feed. Stop by and say hi. The Emperor of Mars / by Patrick Samphire / published by Christy Ottaviano Books / A sneek peak at the art for book 2 of Patrick Samphire's Secrets of the Dragon Tomb series, due out July 18th, 2017. If dragons on Mars, Regency period space travel or steam powered grouper ships are your thing, then this series is right up your alley. And if you haven't read book 1 of the series, Secrets of the Dragon Tomb, then there's no time like the present.